Quel est le Marfa | 6o8? A 4 chambres / 2 salles de bain résidence élégante et confortable à Marfa, au Texas, disponible à la location de vacances. La maison d'origine est une maison de West Texas Adobe qui a été construit dans les années 1940 et a été entièrement rénové en 2004. La maison est d'environ 2200 pieds carrés avec une grande terrasse extérieure et cour clôturée, donc il ya beaucoup d'espace. Vous louez toute la maison ... Vous ne serez pas le partager avec des étrangers. Pourquoi je veux une maison d'hôtes? Tout d'abord, le confort - Soft fil haute draps en coton, planchers de bois franc, cuisine complète, buanderie, terrain, terrasse avec foyer, Central A / C! Deuxièmement, la vie privée - nuff said. Quatrièmement, la technologie - internet wifi, télévision par câble, et un téléphone sont disponibles sans frais supplémentaires! Really a nice place to stay with everything you need and plenty of room for our group of 5. Could comfortably fit a few more depending on your sleeping arrangements. Was nice sitting in the backyard in the mornings, kitchen was well-equipped, and it's close to everything. Much preferred over a tiny hotel room. There was lots more room than I expected with big bedrooms, and an enormous living room and kitchen. 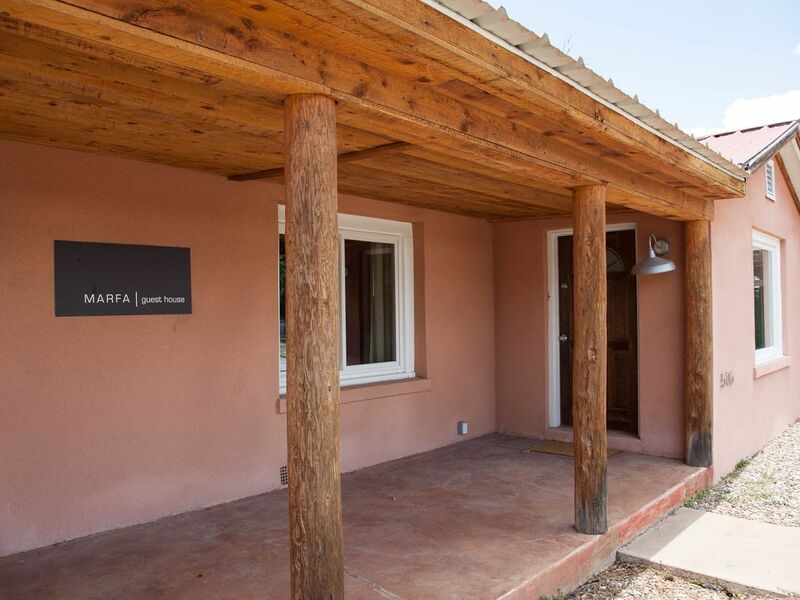 We arrived to a spotless house, and all the information about the unit including tips about Marfa was included in an organized booklet. great host! Hope to return again soon! The home was beautiful, cozy, and comfortable. Very clean and overall happy with our stay. We would definitely stay here again. It was spacious and charming. Kitchen had everything we needed for cooking. Good location, a very short drive into main part of town. Very clean and excellently decorated, bedding and sheets were luxurious! This was my second year to stay at this house. Good location, very clean, comfortable beds. This was a girls yoga trip. If we go again.next year will stay here. Base rate includes 2 people, $30 each add'l person / night; 2 night minimum stay. Please note that holiday and special events are at higher rates and longer min. stay including all nat'l holidays, Chinati Weekend, Marfa Lights Festival, Film Festival, Spring Break, etc. Dogs are welcome to stay for an additional fee (max 2).